Visualise your sets with the DDJ-RZX controller for rekordbox video. Designed for DJs on the road, it comes with three 7-inch touch screens that let you close your laptop and get intuitive control over audio and video features in rekordbox dj and rekordbox video directly from the hardware. 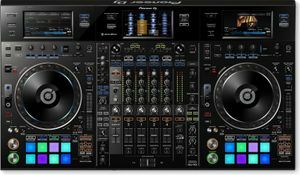 The DDJ-RZX inherits traits from the CDJ-2000NXS2 multiplayer and DJM mixer series including large jog wheels, multicoloured Performance Pads and high-quality sound. Plus an extensive FX unit lets you trigger Mic FX, Combo FX, Sampler Repeat and Release FX � as well as the studio-quality Sound Colour FX from the DJM-900NXS2.